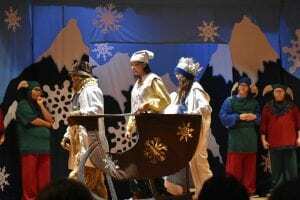 The Missoula Children’s Theatre presented “Snow Queen” at the Cheyenne-Eagle Butte auditorium on Friday and Saturday, November 30 and December 1. 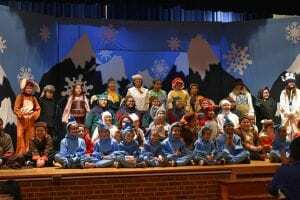 Almost fifty C-EB students participated in the original musical production, based on Hans Christian Andersen’s classic tale. The story followed the play’s protagonist, Gerda, who on a was quest to find her friend, Kay, who was bewitched by the antagonist Snow Queen. Throughout her adventure, Gerda, met a variety of animals such as, foxes, bears, snow chickens, and humans who did not always have the best intentions; yet, Gerda preserved and remained undeterred to help her friend. C-EB Music Teacher Cheryl Ulmer served as the accompanist, providing live piano music during songs. 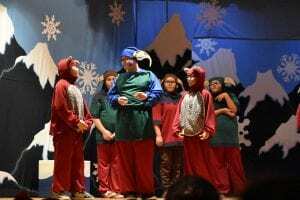 One song that garnered much applause was the anthem of the snow chickens, played by younger students dressed in blue costumes, who sang “bok bok bok bok” in unison as they waved their arms up and down. Attendance was high for the showings on both days, and many families presented their young thespians with gifts of flowers and chocolates.